For the last time the German showmaster and moderator Thomas Gottschalk presented the Wetten dass..? summer special at Mallorca. On June 18th, 2011, he celebrated his goodbye to the family TV show “Wetten dass..?” at the Coliseo Balear – together with international star guests, about 9000 live spectators and about 12,43 Mio TV-viewers. For the great goodbye show in Palma de Mallorca, A&O Technology delivered by order of the company voss | mediaDesign GmbH FALCON xenon searchlights. Inter alia totally 32 FALCON BEAM colour 3000W provided glorious light during Gottschalks last live Wetten dass..? summer show. Hitherto A&O Technology supports all the four Wetten dass..? summer shows at Mallorca. Responsible for the show light was Michael Donecker, 1st camera man of the German TV channel ZDF. Currently, no one knows, who will take over the presentation of the show, beneath co-moderator Michelle Hunziker. This year, he still will present the three Best-Of Wetten dass..? shows for the 30th jubilee and then he will finalize his career at Wetten dass..?. Whilst people in Germany are waiting in vain for warm temperatures, the summer will already started on Whit Sunday at German TV channel ZDF: As soon as the 23 May 2010 the ZDF had shown the summer edition of “Wetten dass..?”, a German gaming show with bets and stars, live from the Coliseo Balear on Mallorca. For the fourth time the summer show took place at the Balearic Island, where currently the temperatures are of 20 °C. 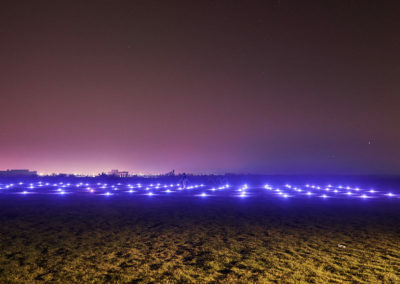 For the show the company Voss Mediadesign ordered a total of forty FALCON BEAM 3.000W from A&O Technology Germany. 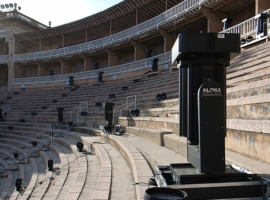 With it, A&O delivered FALCON xenon searchlights of the manufacturer alpha one for the third time to the historic bullfighting arena of Mallorca. Lighting designer Michael Donecker, 1. cameraman of the ZDF, was responsible for the lighting design. 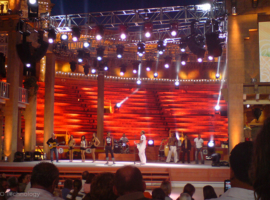 It was the 182nd edition of the German hit series “Wetten, dass..?” and the third (after similar excursions in 1999 and 2007) to be staged on the Balearic island of Mallorca: On the 13th July 2009, Thomas Gottschalk presented the third Open Air Summer Special from Mallorca – a heady cocktail of bets, celebrity interviews and show interludes – in temperatures of around 35 degrees Celsius. 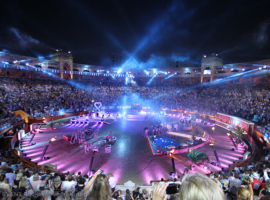 With 9,000 spectators packing the historic arena and just under ten million following the event (which was broadcast live by ZDF, ORF and SF) on television screens throughout the German-speaking world, it will be remembered as one of the TV highlights of the summer. 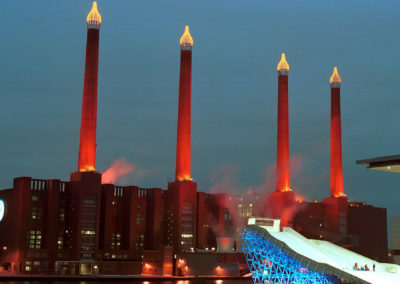 As was the case in 2007, A&O Technology was engaged by voss | mediaDesign GmbH to supply some 40 tons of material for the light show. This was conveyed from Germany to Spain by Armada Logistics in an A&O advertising truck. 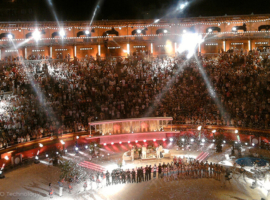 For “Wetten, dass..?”, the Coliseo Balear, a bullring almost a century old, was equipped inter alia with forty FALCON BEAM 3kW xenon searchlights, which the team from voss | mediaDesign GmbH dotted around the second row as stipulated by the lighting design. 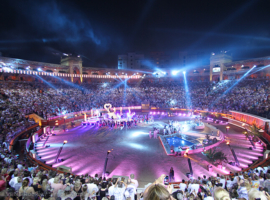 From this vantage point, they were able not only to illuminate to spectacular effect the arena itself but also project powerful beams over the walls and out into the night sky. 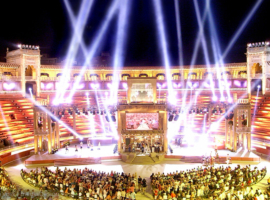 When combined with the other luminaires, LEDs and pyrotechnic effects deployed for the broadcast, the 120,000 watt xenon searchlights displayed the arcades and arches of the Coliseo Balear in an entirely new light: colourful, vibrant and astonishingly bright, with the beams radiating outwards from the centre to the most distant rows of the arena. It took something like a week to set up the equipment for the show. 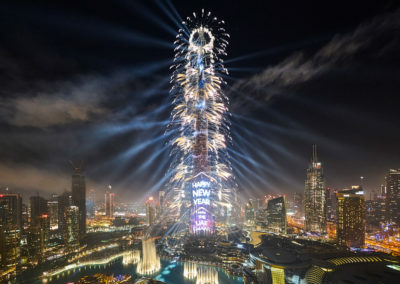 The team from voss | mediaDesign GmbH had not only to manoeuvre into position and aim the searchlights themselves but also to furnish them with power supplies and palettes and run literally kilometres of cable. 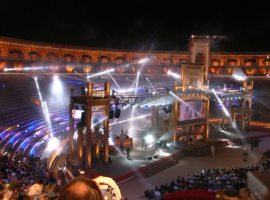 This was the first time the “Wetten, dass..?” stage had been shown from 360° – a concept that was the brainchild of ZDF First Cameraman Michael Donecker and in which the lavish battery of luminaires played a key role. 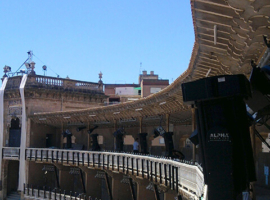 A crane-mounted camera and a spidercam were then used to offer those following the show on television a view of the Coliseo Balear’s illuminated circular terraces with their throng of spectators. 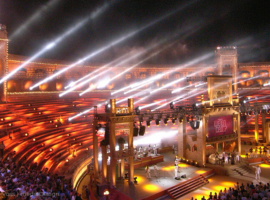 The summer special of „Wetten dass ..?“ was shown by the German television channel ZDF in June 2007 from the bullfighting arena „Coliseo Balear“ in Palma de Mallorca. The Open-Air highlight of the summer came up with a lot of prominence, who were sitting at the couch of host Thomas Gottschalk, or provided for musical entertainment. 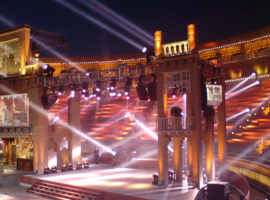 The complete live show was set in stage visually with alpha one lighting fixtures of the FALCON-Range, delivered and installed by A&O Technology. By order of the company Voss Mediadesign, A&O Lighting Technology delivered and installed 42 FALCON BEAM 3.000 Watt xenon searchlights. 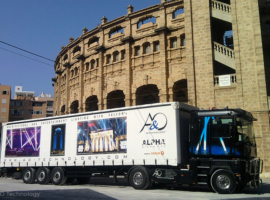 For unloading the trailer, the installation and the rehearsal, the A&O team had to arrive at Balearic Island 13 days before the live show, for that the huge construction of stage setting would be well timed set in stage with light. Additionally the equipment of alpha one was in use for recording “Viva Mallorca” on 20th June. The music show was moderated by the German moderator Andrea Kievel and took place in the same stage setting like “Wetten dass ..?”. 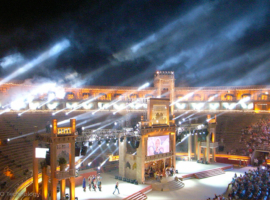 The lighting fixtures of the FALCON range were placed by A&O in different hight scales within the arena and standing at the truss, which were built-on right-sided and left-sided by the main stage. Responsible for the lighting design was Michael Donecker / 1. cameraman of ZDF. After the rehearsal for „Wetten dass…?“ and an unobstructed TV-Live-Show, A&O Technology dismantled the lighting technology within 2 days. The German TV channel ZDF was really pleased with the result of the production. 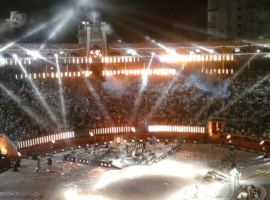 A&O Lighting Technology supported the TV event “Viva Mallorca” on behalf of Voss Mediadesign. 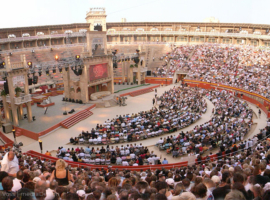 This is a music show with several acts and small intermediate moderations by Andrea Kiewel, which was recorded in the bullring Coliseo Balear in Palma de Mallorca in front of 5,000 guests. The first part has already been broadcast, the second part will be broadcast by ZDF at the end of August. Michael Donecker / 1st cameraman of ZDF was responsible for the lighting design of the production. Manfred Voss, Voss Mediadesign, operated the show lighting. 42 FALCON BEAM 3.000 Watt Xenon Searchlights of the manufacturer alpha one were used. The lighting systems were installed at different levels in the arena or placed standing on trusses to the left and right of the main stage. 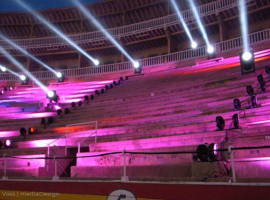 The delivery and installation of the lighting systems was carried out by A&O Lighting Technology GmbH.